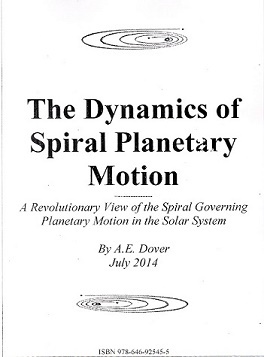 I believes that it is important that the principles of spiral planetary motion here outlined, should be broadcast and subjected to review as widely as possible by amateur astronomy in genera. The veracity and authenticity of the study rests soundly on scientific principles and data. It represents my lifelong study as an amateur astronomer and I am convinced that it is of great interest and has great potential for the future of astronomy. I appreciate that by far, most of today’s astronomical societies are mainly focused on the night sky and the cosmos, whereas the objective here is to bring the attention of as many students as possible to examine aspects of the motion of the planets of our Solar System. You will find that it is an aspect that has been seriously overlooked for 360 years and presents the possibility to examine the development of our planet through eons in a manner previously unforeseen; also the future motion of our planets can be more clearly envisaged and investigated. Thus, amateur astronomy can play a leading role to enrich the science of astronomy.